Before I left for college and still lived at home, I cooked dinner for my family almost every night. When someone else is buying the ingredients and doing most of the dishes, it makes it easier. My mom loved it, and I always had fun coming up with recipes. So back then, I created a recipe blog to share some of my recipes that I created. It never took off — because, well, I had no idea what I was doing — but I was looking at it the other day and realized I really did have some fun recipes. One of those is this chicken enchilada soup. 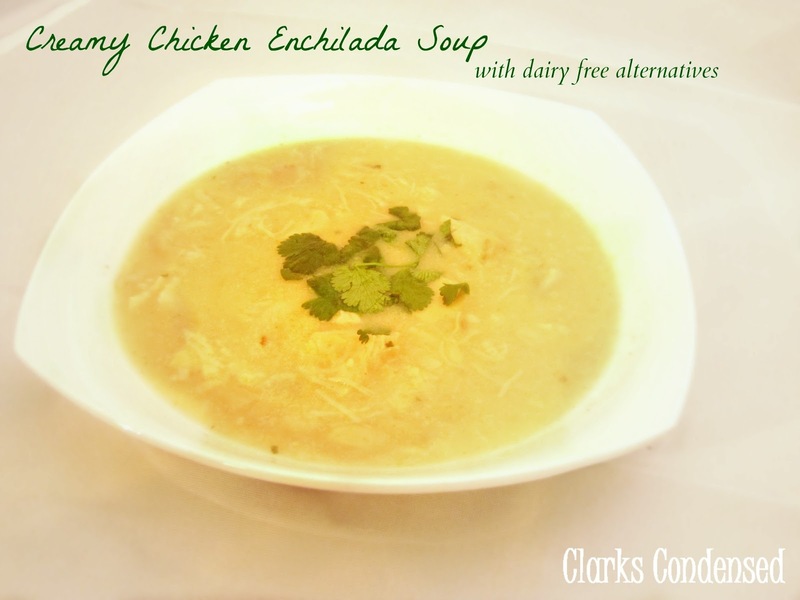 It makes sense that this is one of my favorite soup recipes — I LOVE chicken enchiladas. And this soup is definitely a crowd pleaser. I made it for an activity at church awhile back, and I was so excited when it was the first one gone, and everyone was asking for it! It has delicate flavors, and tastes just like chicken enchiladas — at least, I sure think so. I can’t even remember where I first had this recipe, but I’m forever indebted to that person. I’ve changed it around quite a bit, especially because now I try and make it dairy free (but it still tastes just as creamy and delicious.) This can easily be made in the crock pot — about four hours on low — and it makes a ton. I have included my dairy free alternatives, for anyone that is interested. I found that it doesn’t change the flavor at all, and if anything, makes it even better. Pour chicken, beans, chicken broth, cream of chicken soup, and enchilada sauce into large pot and mix together with wooden spoon. Add remaining ingredients, except for evaporated milk, and bring to a boil. Let boil for 2 minutes, continuously stirring, and then bring down to a simmer. Stir occasionally. Add evaporated milk 30 minutes before serving. Serve with shredded cheese and tortilla cheese. As silly as this may sound, I had no idea that you could make your own cream of “whatever” soup (chicken, mushroom, etc.) until a few months ago when I was trying to find a dairy free substitute. It’s so easy, much healthier, and totally delicious. This equals one can of soup. I usually just eyeball things, but last time, I measured everything out, so this should work perfectly! Turn burner on to medium-high and let pan heat up. Put butter in pan and melt. Add flour and whisk together. Slowly add in milk and whisk continuously, and then add in ingredient of choice. Whisk until thickened. If using onions, mushrooms, or celery, saute until soft before making the soup. Do you use full fat Almond Milk in your recipes or do you use the lighter versions? I typically use Silk 30 or 60 calorie. What is a butter substitute? Where do you buy it? I was looking for a crock pot Haystack recipe and found yours then I clicked on your “Cream of “Whatever” Soup and found your Chicken Enchilada Soup. The recipe ingredients starts out with 25 ounces of and then nothing. I am assuming that it means the cans you used are all 25 ounces. And if I am correct have you have tried it with smaller can sizes. This sounds very good and I am looking forward to trying it. Oops! I recently moved this recipe over to a new format, and it looks like that part got cut out. It’s actually 25 ounces of canned chicken 🙂 Let me know if you have any other questions! I loooove Enchilada soup! This makes me want to go make some right now! 🙂 Thanks for linking up at Sweet & Savoury Sundays!